Dr. Ochola is currently the Global Head and Director, Strategy and Innovation at Afreximbank, a position he assumed on joining the Bank in October 2015. During the two years he has spent at the African Export-Import Bank has was responsible for the development of the Bank’s Intra-African Trade Strategy as well as development of the Bank’s Impact 2021 – Africa Transformed five year strategy covering the period 2017 to 2021. He has over ten years of experience in Strategy Development and Innovation in both the Mobile Telecommunications and Banking Sectors across Africa and the Middle East. Dr. Ochola specializes in developing strong customer value propositions grounded on customer insights, as well as a detailed research based and methodical approach to drive innovation especially in the area of financial solutions. Prior to joining Afreximbank, Dr. Ochola served as Head of Strategy with Safaricom Ltd where he developed various innovative products. 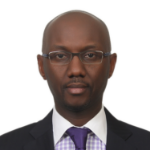 Preceding that, he worked with KCB Bank Group Ltd in Kenya as Director Strategy, Research and Innovation responsible for driving strategy across the Group and Subsidiaries where he lead the development of their award winning mobile banking platform. Dr. Ochola holds a PhD in Mechanical Engineering from UCT and MSC, DIC and BENG from Imperial College London. He has published peer reviewed ground breaking research articles in Engineering International Journals.